The PGA Tour has unveiled its revamped tournament schedule for the 2018-19 season, which features significant changes and will culminate with the FedExCup Playoffs in August. The FedExCup Playoff series will now feature just three events rather than the previous four with the Dell Technologies Championship disappearing from the tournament calendar. Those three are the Northern Trust (AUG 8-11), the BMW Championship (AUG 15-18), and the Tour Championship (AUG 22-25). Beginning in 2020, the Northern Trust will swap between a New York City area host and the TPC Boston every year. Two new tournaments have been added – the Rocket Mortgage Classic (June 24-30), which will become the first PGA Tour tournament to be held in Detroit. The 3M Open, a former Champions Tour event, will take place a week later at TPC Twin Cities in Blaine, Minnesota. The biggest changes, which have been announced previously, will see the Players Championship move from its traditional position in May to mid-March while the PGA Championship will shift from August to mid-May for the first time since 1949. The major will also make its debut at Bethpage Black on New York’s Long Island – the previous home of the US Open in 2002 (Tiger Woods) and 2009 (Lucas Glover). The Bridgestone Invitational, which is normally the final World Golf Championships event of the season, will move to late July at TPC Southwind in Memphis and will be known as the WGC-FedEx St. Jude Invitational. 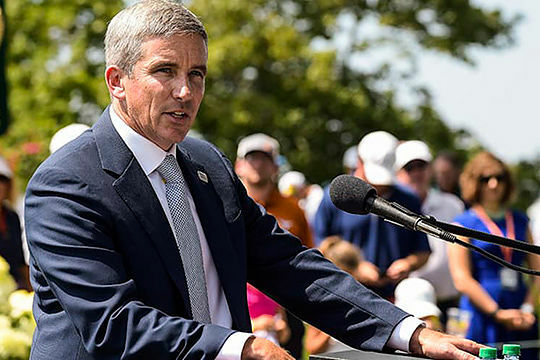 “We are extremely pleased with the way the schedule has come together, particularly with the number of changes that were involved and the strength of the partnerships required to achieve this new look,” said PGA Tour Commissioner Jay Monahan.